A premier Dulles Town Center restaurant, we open our doors each day excited to create made-to-order dishes full of fresh, healthy ingredients. Nothing is pre-made, and everything is delicious. We love talking with our customers, and we’re often asked about our most popular dishes. When everything on the menu looks so tempting, a new guest wonders where to begin. It’s such a great question! Today we’re giving you a peek behind the scenes. We’re sharing the healthy go-to classics that both our new guests and returning customers rave about. But first let’s zoom out a bit: what makes Cafesano’s menu so healthy – and so incredibly delicious, too? We’re proud to say our menu was created with a focus on the world’s healthiest way of eating, the Mediterranean Diet. 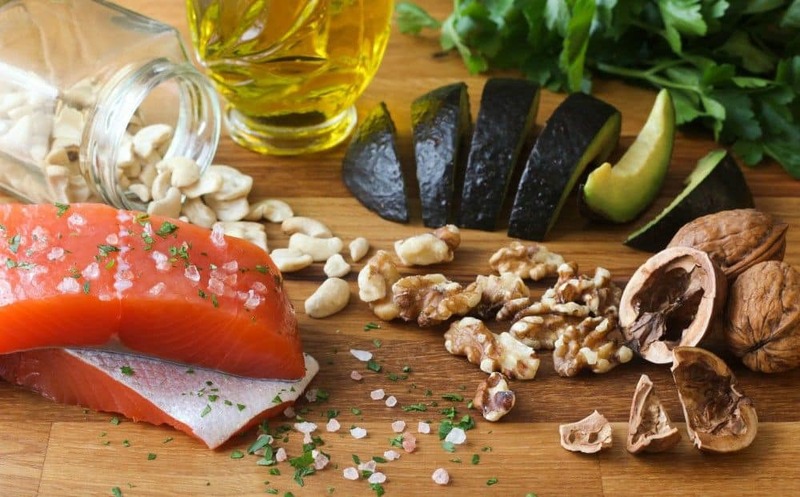 The Mediterranean Diet is a heart-healthy eating plan that incorporates the building blocks of healthy eating. 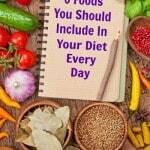 It emphasizes mostly plant-based foods, such as fruits and vegetables, whole grains, legumes and nuts. Butter is replaced with healthy fats like olive oil. The diet also encourages swapping out unhealthy salt with herbs and spices and limiting red meat. Think splashes of rich, flavorful olive oil and perhaps a glass of red wine. 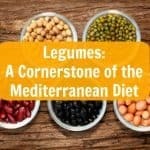 The principles of this diet harken back to the traditional cooking methods of the nations along the Mediterranean Sea. 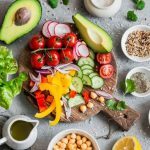 Again and again, research has shown that the Mediterranean Diet reduces the risk of heart disease. It’s also been associated with a lower level of the “bad” (LDL) cholesterol – the kind that often builds up deposits in your arteries. Throw in a reduced risk of cancer, Parkinson’s, Alzheimer’s, depression and even lower overall mortality, and there’s no reason not to give it a try. You may find it’s just what you need. But does this way of eating actually taste good? Making delicious, nourishing food for you is our passion. Next time you come in to see us at our Dulles Town Center restaurant or Reston location, give one of these fan favorites a try. Why not kick things off with a Mediterranean classic? Our hummus appetizer is created right in our kitchen from fresh chickpeas pureed with tahini, fresh lemon juice and garlic. It pairs perfectly with our warm whole grain pita bread or fresh lavash chips. And of course, it’s topped off with extra virgin olive oil. Wondering what extra virgin olive oil actually is? Extra virgin olive oil (EVOO) is the fresh, natural juice squeezed from olives exactly one day after harvest. The olive oil is extracted without the use of heat or chemicals. The “extra” designation means it’s the highest grade there is for the best, unrefined and unprocessed oil. Not just any olive oil gets to be graded “extra” – it must exhibit the very best taste, aroma, and even color! Did you know olive oil is also linked to lower incidences of many forms of cancer? It can help your system guard against other issues like ulcers, gastritis and gallstones, too. It reduces the risk of coronary heart disease and atherosclerosis by reducing your blood cholesterol levels. 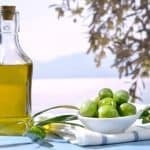 Olive oil can reduce the risk of diabetes and, possibly, a delayed onset of complications in established diabetes. Simply put, the “extra” in extra virgin olive oil means premium, or only the very best. It reflects our philosophy not just in relation to our olive oils, but our menu, ingredients, and your experience when you visit us. Only the absolute best is good enough for our guests. Who doesn’t enjoy a lovingly-prepared fresh salad that’s bursting with flavor? One of our biggest crowd-pleasers features romaine, artichokes, tomatoes, cucumbers, kalamata olives and red onions, topped off with fresh avocado and mozzarella. Enjoy your salad with our homemade house dressing made fresh each day, our parmesan crisp and grilled ciabatta. Studies show that eating a large serving of fresh, raw vegetables every day comes with huge health benefits. These include disease prevention, an easier time maintaining a healthy weight and a sense of youthful energy and vitality. Try your salad as a side to complement any of our main dishes or make it into its own meal when you add a grilled skewer. Pair your signature salad with any of our skewer selections: marinated chicken, seasoned steak or shrimp, Atlantic salmon, falafel or even keep the veggies coming with our mixed vegetable skewer. This panini is packed with mouthwatering marinated chicken breast, roasted peppers and grilled zucchini and served with our homemade basil pesto. It’s amazing on either a regular or whole grain ciabatta. Be sure to pair it with our baked lavash chips or Terra Chips©. A toasted sandwich with Italian bread, the panini as we know it today became trendy in the bars of Milan in the 1970s. Office workers were on the hunt for a quick lunch option that was also fresh and delicious – a quest that still resonates with our customers today. The panini fit the bill perfectly! Soon, stateside restaurants started serving them, and their popularity skyrocketed. The panini craze moved along to U.S. cities, each producing slightly different variations of the sandwich. We’re proud to continue spreading the panini love here at our Dulles Town Center restaurant. Try ours and tell us what you think! The simplest variety of our thin-crust 12″ and 8″ brick over pizza hits a home run with our guests time after time. Your pizza is baked to order, right in our brick oven. We’re also happy to make it with gluten-free crust. 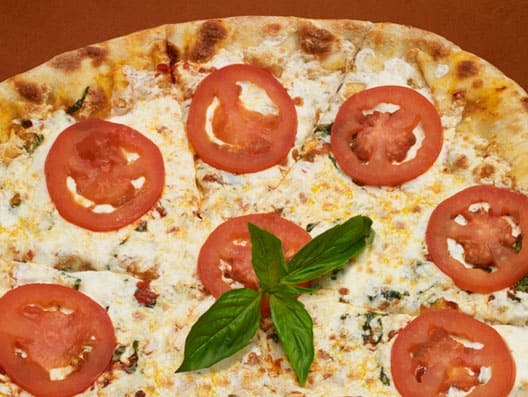 What makes brick oven pizza especially delicious? Our ancestors started cooking in brick ovens around the beginning of civilization. Extremely hot temperatures of 800 degrees mean your pizza is baked in a much shorter amount of time, too. The flow of air and heat inside the brick walls allows for crispier toppings and veggies that stay rich in both flavor and nutrients. Brick oven pizzas are both healthier and tastier. And as a bonus, our guests also love the look of the brick oven. It’s a nod to the timeless cooking methods we embrace here at Cafesano. Rice, grilled vegetables, salad, pita bread and tzatziki sauce – what could be better (or healthier)? Choose between regular or brown basmati rice, and regular or whole grain pita. You can also substitute extra salad for rice. Whatever you choose, you can’t go wrong! Another delicious option you’ll love: our kabob wrap. 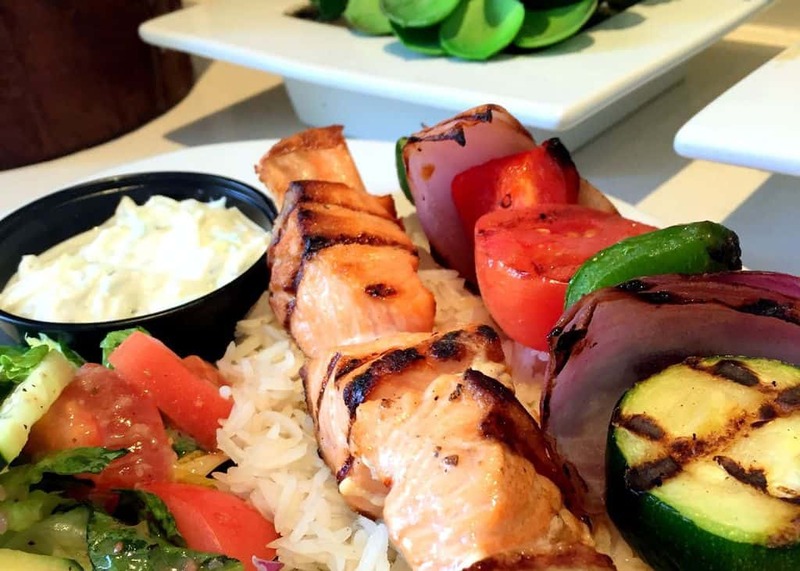 Enjoy a grilled chicken or steak skewer wrapped up with tomatoes, cucumbers, red onions, romaine and our tzatziki sauce. We’re looking forward to your visit, whether it’s at our Dulles Town Center restaurant or Reston location. And don’t forget: each of these customer favorites are available for takeout and on our catering menu. Choose your location and come on in! 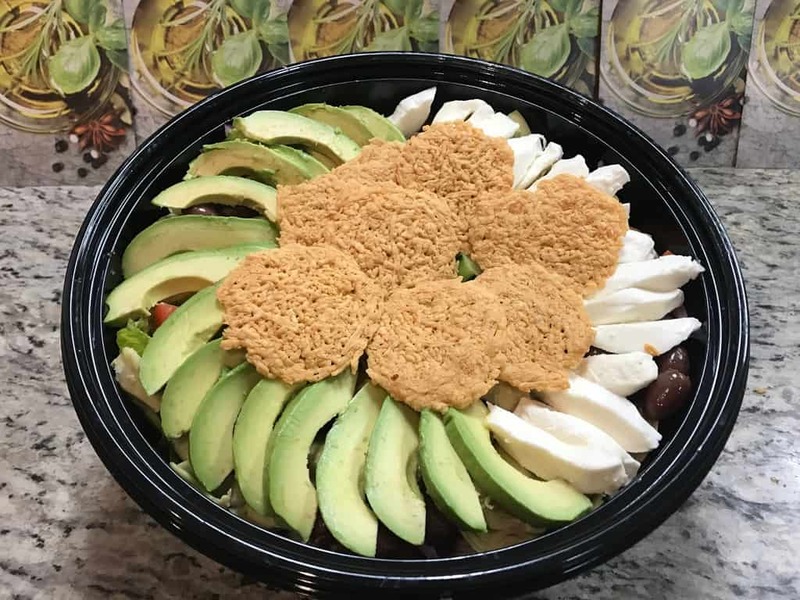 This entry was posted in Healthy Dining in Northern Virginia, Healthy Food, Northern Virginia's Best Restaurants, Restaurants in Dulles VA by Cafesano. Bookmark the permalink.